Nathalie Xian Yi Yan, PhD from Liaoning University of Traditional Chinese Medicine (TCM) has brought new perspective to San Jiao, one of the oldest academically-disputed subjects in TCM history. She fine-tuned the definition and pointed out that there are four functional phases of San Jiao that carry and transform the essence of substances and energy to perform biological functions. Work based on her clinical practice in Hamilton have added new insight into a guiding path the understanding of San Jiao, an unique ancient TCM model of how the body functions and becomes ill, providing a more proactive prevention protocol for health care. The basic principle of TCM is to bring the body into harmony with itself and in balance with the outer environment. It is a unique approach to health care, which examines every aspect of a person’s health and how the body’s systems interrelate, complement, stimulate and correct each other. In TCM the body is a complex and sophisticated interdependent system, which must function properly for mental, physical and spiritual health to be achieved and maintained. Imbalance and lack of integration of the different internal bodily systems and body-environment interfaces is the root sources of all health related problems in the TCM philosophy. TCM differs in its approach to Modern medicine, which tends to see disease as coming from outside which include the organism such as germs, bacteria, viruses, etc. In TCM most diseases are seen as originating within the body through biological function degeneration and it puts the amelioration and curing of the problem within the power of the body’s innate capacity, i.e. its original and acquired constitution, a capacity which can be strengthened through TCM techniques. Therefore restoratives and natural remedies that improve balance and the interdependent functioning of the bodily systems are the emphasis. This gives TCM an essential role in general health care and an important enhancement to modern medical techniques, especially in areas of chronic, long-term disabilities and illnesses. Although Modern Medicine and Traditional Chinese Medicine have the same general goal of health in mind, they approach it from different viewpoints altogether, reflecting the different worldviews and philosophies of the cultures involved. TCM seeks to restore harmony and balance to the body so that it functions by itself as an equanimous whole. TCM subsumes an ancient, proven tradition of several thousand years of knowledge about plants, animals and minerals and how to combine these to prevent and rectify common bodily disorders. Much of this knowledge is simply not known or unacknowledged by the Modern Medicine, drugs, world. Health is the number one priority in all cultures and civilizations throughout the ages. It is a gift and a right, but it is also a responsibility. TCM believes in promoting a healthier way of life and empowering people to maintain a healthy balance in their lifestyle and correct imbalances, which lead to chronic illnesses. By providing a strong foundation for all internal systems to work together, the use of TCM results in a more enjoyable quality of life, greater mental and physical health and increased longevity. Each year, more than 50 million North Americans suffer from allergic disease. Cardiovascular disease claimed over 100,000 lives in US in 2000. Nearly 45% of the population experiences heartburn. There are 20 million people North American who have diabetes. One of every three adults has arthritis and chronic joint symptoms. 22% of the population suffers from depression severe enough to look for treatment at some time in their lives. Countless billions of dollars are spent every year to seek relief and cures. 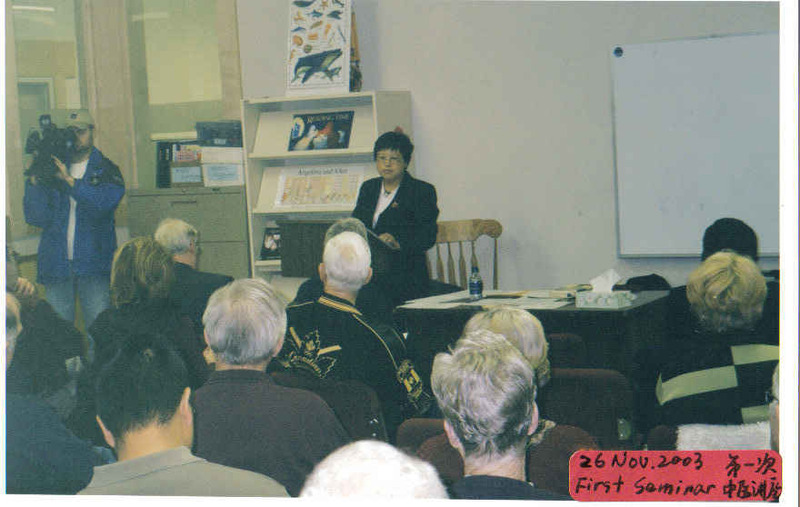 Nathalie Xian Yi Yan, PhD established the Hamilton Traditional Chinese Medical Health Center 17 years ago to investigate and diagnose individual health issues. The clinic treats gastrointestinal, cardiovascular, endocrine disorder, respiratory problems, immune system, dermatological, genitourinary, reproductive system, mental and emotional problems, aging and recovery from illness and surgery. With concentrated, customized tea blends and specialized Chinese Medicine pills, tablets and capsules, the clinic also specializes in acute and chronic musculoskeletal and neurological pain and in the use of various acupuncture methodology treatment where appropriate. Nathalie Xian Yi Yan, PhD vision is the unification of eastern and modern practices to create a new health care synthesis, which utilizes the proven techniques of both disciplines. Depending on the circumstances, both are effective. Together they offer the possibility of a quantum leap forward in the quality of life and health for all the world’s citizens. 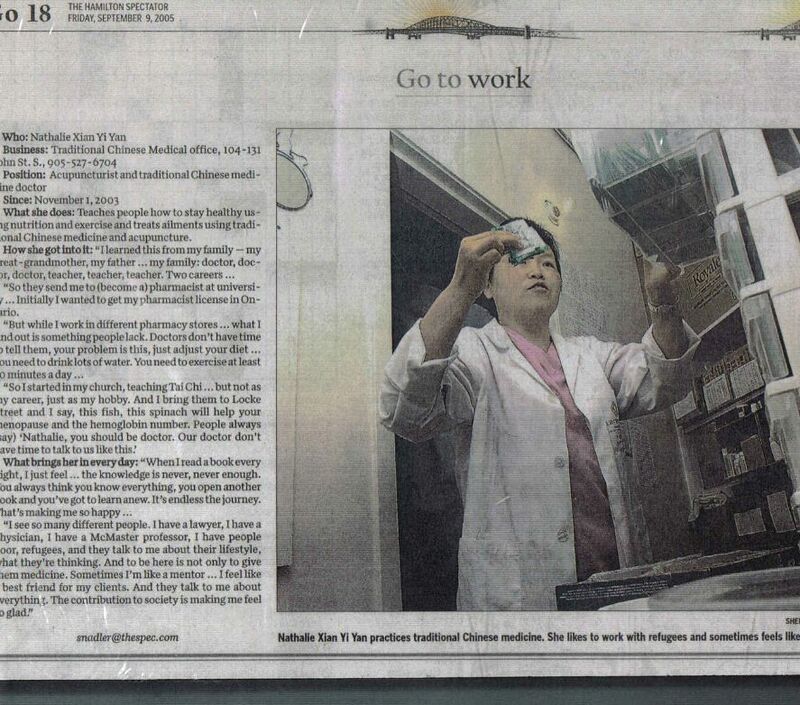 Nathalie Xian Yi Yan, PhD comes from a long family tradition of Chinese Medicine practice. She graduated from the Pharmaceutical University of China in 1987 as a Biochemical Pharmacist. She finished post-graduate work in Shang Hai Normal University under the famous professor Dr. Xu, Chang Hua. She then went to Nan Jing Traditional Chinese Medical University, her hometown studying. 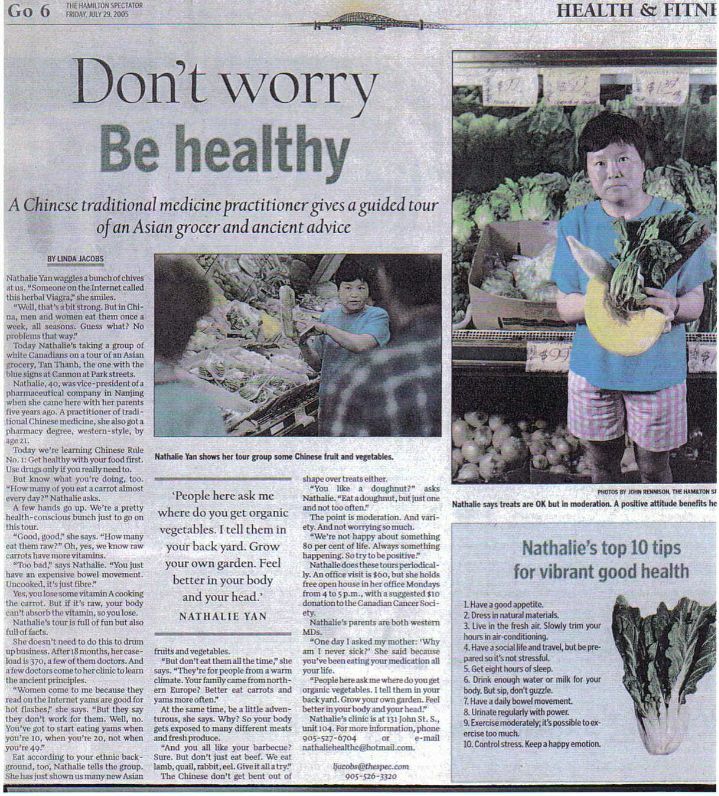 She still works closely with her uncle and parents, who each have several decades of expertise in TCM. Nathalie Xian Yi Yan like to share her extensive knowledge and experience in both sides of the health care system which has resulted in astonishing outcomes for her patients, making her clinic a vital addition to the Hamilton and Canadian health care infrastructure.